Prevue Hendryx is the largest and oldest manufacturer of quality pet cages and related accessories in the United States. They have pioneered and innovated the pet cage market since 1869, being the U.S. leading manufacturer and importer of pet cages. Prevue Hendryx is the only U.S. company to offer a full product line of bird cages, toys and accessories; Dog training crates, Travel crates, Small animal cages and accessories, Feeding dishes, Exercise pens and Tie-Out Chains. • For: Budgies, Canaries, Cockatiels, Finches, and Parrots. 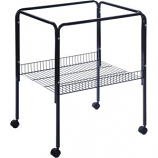 Tubular steel construction with easy-rolling casters. Easy to assemble. Integrated mid-height storage shelf. 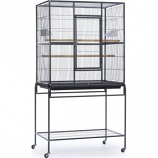 Fits cage model #25211 #25212 #25217. . Designed for short-term travel use for small parrots. Cup holders lock in place to keep cups secure during travel. Pull-out debris tray with wire rail stopper to hold tray in place. Integrated bottom grille is not removable. .
Wrought iron dome top construction offers quality craftsmanship at an affordable price. Heavy-duty push button door lock plus windbell lock to keep your bird secure. Expertly engineered for easy assembly. . . Mesh trough bottom allows pellet dust to sift out of feeder. Holds snug to inside or outside of any cage. Perfect for rabbit guinea pigs and similar-sized small animals. May be used for food pellets or Timothy Hay. Holds up to a 5-day supply of food. Ideal for parakeets cockatiels lovebirds. Large front door lets you easily access the cage. Removable bottom grille and pull out tray for easy cleaning. . .
Vintage scrollwork design with decorative finial for hanging. Front access landing-style door. Removable grille; pull-out debris tray for easy cleaning. . .
All-welded axle wheel with powder-coated chrome silver finish. 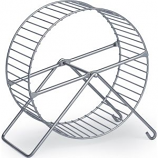 Stand wheel on cage floor or hang from cage wires. . . . 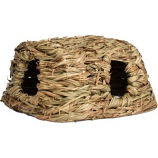 Designed for small birds such as finches parakeets and cockatiels. 2 hooded plastic cups 2 wood perches bottom grille and pull-out tray included. Expertly engineered for pet safety with minimal assembly. Roomy shaped roofline provides additional space for hanging toys. Approximately 16'' long 14'' wide and 18'' high with 3/8'' wire spacing. 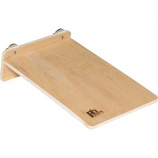 Unvarnished wood platform gives small animals a place to sit play climb or rest. Satisfies natural instincts to be above ground level for eating or sleeping. 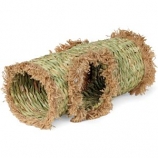 Ideal for rabbits guinea pigs or similar-sized small animals. Attaches with wing nuts and fits most cages; hardware included. .
A great showcase for your birds!. 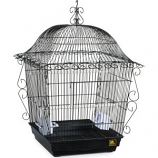 Large wrought iron flight cage for multiple small birds. One large hinged front access door and two small side access/cup doors. Pull-out grille and debris tray for easy cleaning. 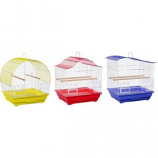 Ideal for canaries parakeets and other small to medium size birds. • Roomy House Features A Double Roof Style With Top Drop-Down Perch Door and Large Front Opening Door For Easy Access To Pets • Removable Bottom Grille and Pull-Out Drawer Allow For Easy Cleaning • Includes 2 Front Outside-Access Feed/Water Cups, 2 Perches and Is Designed For Parakeets, Cockatiels and Other Small Birds. Compact Enough To Even Fit Into An Apartment, Plus It Comes With A Ramp and Platform, To Give Pet A Little More Room. • Features A Wire Bottom Basket Grille That Easily Snaps Into The Plastic Base • Includes 2 Plastic Outside-Access Feed/Water Cups, 2 Perches, 1 Swing and Comes In An Assortment Of Colors and Styles • Ideal For Canaries, Finches and Other Small Birds. 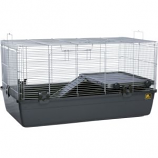 Two Story Hamster and Gerbil Cage, One House, One Exercise Wheel, 14 X 11 X 16 H .
• Roomy Cage Features A Large Front-Opening Door, Top Carryinghandle, Removable Bottom Grille • Also Has Pull-Out Bottom Drawer For Easy Cleaning • Includes 2 Plastic Hooded Cups and 2 Wood Perches and Is Designed For Parakeets, Cockatiels and Other Small To Medium Birds. • Features A Removable Bottom Grille and Pull-Out Drawer For Easy Cleaning • Includes 2 Plastic Cups, 2 Wood Perches and Are Designed Forparakeets, Canaries and Other Small Birds • 6 Assorted Pastel Colors and Styles. 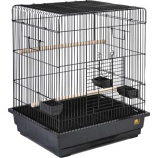 • Features A Unique Triple Roof Design and Has A Removable Bottom Grille and Pull-Out Drawer For Easy Cleaning • Includes 2 Plastic Cups and 4 Wood Perches and Is Designed For Parakeets, Cockatiels and Other Small To Medium Birds. • Mess Guard Snaps Onto The Base To Help Keep The Surrounding Areas Clean. One cage with benefits for small animals in nearly every stage of life. 8-Mar. Large tubby base offers room for exercise and accessories. . .
Hamster Deluxe Duplex, 26 X 14 X 16 Two Houses and One Exercise Wheel. • Features A Pull-Out Drawer For Easy Cleaning and Comes In A Great Assortment Of Styles and Colors • Includes 2 Plastic Outside-Access Feed/Water Cups, 2 Wood Perches, A Carry Handle and Are Designed For Parakeets & Canaries • Great For Other Small Birds. 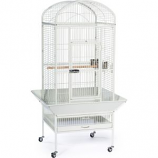 Large front landing-style door allows access to cage interior and a place for bird to perch before entering or existing. Removable grille; pull-out debris tray for easy cleaning. Fits stand #2521S. 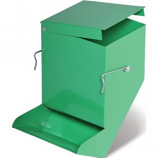 . .
• Features A Large Front Door For Easy Access To Birds and A Removable Bottom Grille and Pull-Out Drawer For Easy Cleaning • Includes 2 Plastic Cups, 2 Wood Perches and Is Designed For Parakeets, Cockatiels and Other Small To Medium Birds. 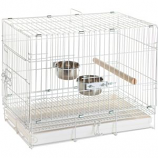 • Large Front Door Provides Access To The Entire Cage Interior, While The Smaller Door-Within-A-Door Allows Ownersto • Access Their Pets Without Opening Up The Entire Cage • Removable Bottom Grille and Pull-Out Bottom Tray Help Make Cleaning Quick and Easy • Includes 2 Plastic Cups, 2 Wood Perches and Is Designed For Parakeets, Canaries and Other Small Birds. Varied branch shapes and diameters provide excellent foot-healthy exercise. 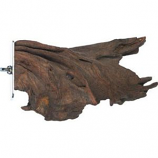 Organic textures create a more natural environment and instinctual experience. 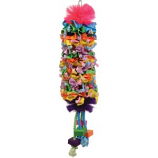 All naturals perches and toys are handmade from wholesome eco-friendly materials. . .
• Features A Pull-Out Drawer For Easy Cleaning • Includes 2 Plastic Cups, 2 Wood Perches and Are Designed Forparakeets, Canaries and Other Small Birds • 8 Assorted Colors and Styles. Birds love to pull these toys apart and unravel the materials. Filled with elements like colorful rope papers plastic or wooden beads hardwood blocks plastic straws and more. Satisfies every birds shredding plucking and preening urges. . .